1992, CardsCardsCards is flanked by Carytown veterans Biff’s Bookstore, Baker's Treat, Rostov's Coffee & Tea and the Byrd Theatre. Mark Burkett enjoys the party. Camille Adams chats up Sheila Taylor in the background. Lisa Cumbey, rocking a Mongrel polo with shoulder pads. Stan hangs with Jack Blanton in the background. Nancy Eberhardt registers for the doorprize. That’s Georgia Terry (center) looking on. Lora Beldon, Ronnie Johnson and Sonya Akers; that's Leslie Vogt in the background. 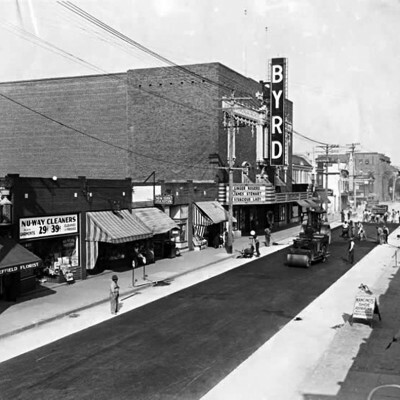 Vivacious Lady starring Ginger Rogers & James Stewart was playing at the Byrd Theater when this photo was taken. Can you spot the future home of Mongrel? Mongrel lives in what used to be two separate buildings. Here is a list of previous businesses / tenants that have occupied the two buildings.